Charles Smiley Presents does have a fine selection of Southern Pacific based titles. Various years, locations and operations are highlighted in these programs. 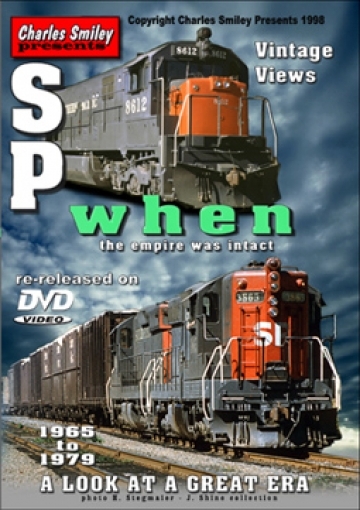 His shows about SP are all very high quality train video productions. They are very consistent. Vintage Southern Pacific is viewed during an interesting time period that is remembered by baby boomers. As great as steam was in its day, those trains were already long gone, by the time a younger generation was watching the diesel era. Many boomers combined prototype trainwatching, with an interest in model railroading. They wanted to model the trains that were in daily operation. So an HO model of a GP9, SD9, SD45 or an F7 was to mirror what was being seen, that day, at trackside. This collection of films on a single DVD gives a comprehensive program on the far-flung assortment of the SP roster between 1965- 1979. The 1960’s had the major locomotive builders innovating continuously, in the highly competitive US market. Electromotive, General Electric and Alco were all purchased by SP. This was long before the advantages of parts standardization were more entrenched. SP when, has a wide array of 1st and 2nd generation EMD models. GE U boats, Alco and Baldwins are all found here. In fact, the relatively rare Fairbanks Morse Trainmasters were kept in commuter service, long after being abandoned by most US railroads. SP rostered GP9 and GPE rebuilds. Versatile, shown in passenger and freight service. North Western Pacific gets a highly detailed overview. This was the stomping grounds for hordes of SD9 diesels. They were often run in lashups of 5 or more units. Fast forward to a 1997 update with some shortlines. A visit inside a huge, modern lumber mill adds more to the story of lumber. SD9’s get an extensive amount of screen time. A 1958 cab ride in an E8 powered Daylight is a thrilling treat! Those popsicle painted rebuilt U-boats, that were Swiss powered rebuilds, get their story told. Too much worthwhile material fit in this review. Just some additional highlights. A mecca of vintage SP in this fine show! The Siskiyou Line is one of the most challenging operations. Ride on some SD45, SD40T lashups on this rugged and scenic route. The trains traversing steep ruling grades and twisting trackage were filmed by an SP employee. This line also serves the big tonnage, lumber trains. The Shasta route features the mixture of general freight traffic. Certain routes were favored for EMD locomotives. Mainly 12 axle models, with high horsepower. Last days of the F units are nicely covered. Amtrak and the early use of the SP F units too. The multiple film sources do offer a cornucopia of fascinating viewpoints. Those films have been digitally enhanced. Employee only type of access sets this show apart from others. Still photos are used to round out the storytelling. Audio consists of: natural audio, music and narration. Very balanced and effective presentation. There are the desirable Charles Smiley ‘extra features’. Custom made maps are frequently referenced. Location and Elevation maps are very handy to have in the show. Extended program length adds to the value. Factory pressed DVD’s are very durable. SP when…. Trainmasters roamed the Earth. A large amount of information is shared. Encompassing Southern Pacific and the world around the SP lines. There is quite a bit to learn here. It will stand up to repeated viewings. This is a treasure trove of classic 60’s and 70’s SP. A must have for any Southern Pacific fan. Any vintage railroad enthusiast will find this a rewarding program with an intriguing assembly of vintage films. As the tagline states: A Look at a Great Era. This entry was posted in ATVR Reviews, Charles Smiley Presents and tagged American Train Video Reviews, California, Railroad, Southern Pacific, Train DVD, transportation by William J. Hudson. Bookmark the permalink.